Note that MONDAY NIGHT FOOTBALL preemptions leave ABC and NBC subject to adjustment. 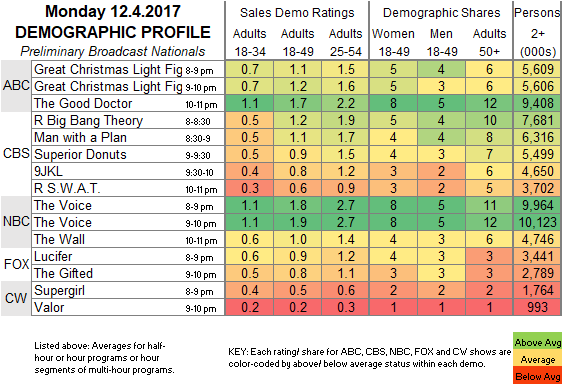 ABC: Currently THE GREAT CHRISTMAS LIGHT FIGHT premiere is at 1.1, and THE GOOD DOCTOR’s midseason finale is steady at 1.7. NBC: THE VOICE is currently steady at 1.9, and THE WALL is at 1.0. CW: The midseason finale of SUPERGIRL dropped 0.4 from last week’s crossover to 0.5, which is where it was 2 weeks ago. VALOR was also steady at 0.2. FOX: LUCIFER returned from a rerun week and held at 0.9, while THE GIFTED fell 0.1 to 0.8. 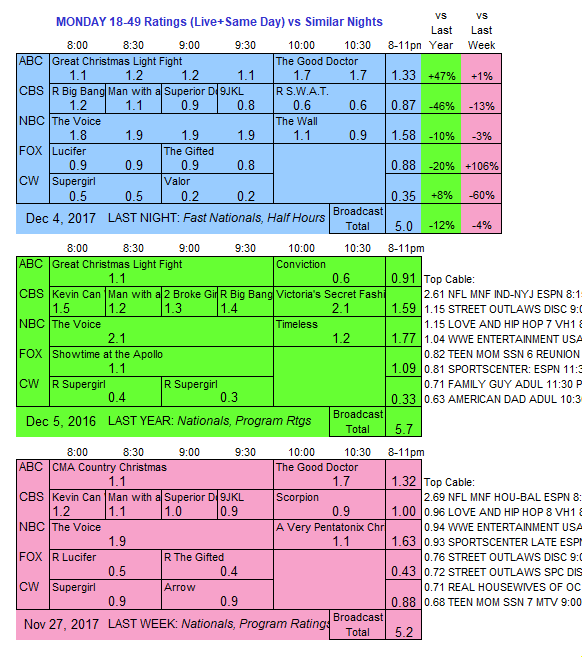 CBS: The night started with a BIG BANG THEORY rerun at 1.2, and ended with an off-night SWAT rerun at 0.6. In between, MAN WITH A PLAN remained at 1.1, SUPERIOR DONUTS dropped 0.1 to 0.9, and 9JKL was also down 0.1 to 0.8. NBC takes a leaf from some cable networks tonight, interrupting hiatus for new holiday episodes of SUPERSTORE and WILL & GRACE.